Rendering by Chaiyapruek Ramintra-Wongwaan, via Behance. Everywhere you look, you can see people working in unconventional spaces. They may be at Panera Bread, at a table at the mall or perched on a park bench. Yet for most people, the traditional workplace remains important. In fact, a well-designed “home base” may be more crucial than ever in this era of increasingly mobile workers and disengaged employees. These factors challenge designers and their clients to create innovative environments where people can and want to be their best. One way to accomplish this goal involves designing workplaces that function similar to the communities in which people live. In an article in the American Journal of Public Health, Kathleen M. MacQueen et al. defined community as “a group of people with diverse characteristics who are linked by social ties, share common perspectives, and engage in joint action in geographical locations or settings.” In this sense, workplaces are like communities – places where people live, work and socialize together. Community design is a methodology in architecture and planning which emphasizes bottom-up design, rather than the more traditional top-down thinking. Architects and designers listen to their clients to truly understand what they are trying to accomplish, both in product and practice. Just as communities consider the diverse needs of their residents, companies need to understand the varying needs and expectations of their people in order to increase engagement and produce places where people want to work. That means creating spaces which foster collaboration, innovation, and camaraderie through social interaction. In other words, like a community, the workplace needs to offer a variety of options to help people feel connected. Such considerations express internal branding that reinforces the organization’s philosophy and goals, and sends the message that “we’re all in this together”. Just as communities consider the diverse needs of their residents, companies need to understand the varying needs and expectations of their people in order to increase engagement and produce places where people want to work. That means creating spaces which foster collaboration, innovation, and camaraderie through social interaction. Instead of simple, physical “space,” psychologist David Canter has developed a theory of “Place” comprised of three elements: activities, meaning, and physical attributes. Focusing on just one of these aspects will not support the creation of a place where people want to be, which in turn negatively impacts both attitude and productivity. Great place-making in a community comes most often from a truly collaborative effort between users of a place and those who help craft it. It’s an integrative process in which architects and designers provide a physical environment based on the input from people in the client organization. Understanding the organization’s activities leads to co-creation of a place where people want to spend their time. If an organization is truly trying to develop a workplace that will support employees so they can do their best work possible, then it is important to create an authentic environment built upon the cultural attributes of the organization. That means the environment reflects the organization’s accepted norms, values, behaviors, aspirations, and purpose. Community design is a methodology in architecture and planning which emphasizes bottom-up design, rather than the more traditional top-down thinking. Architects and designers listen to their clients to truly understand what they are trying to accomplish, both in product and practice. A community design mindset focuses more on the organization’s experiences – what they do and don’t do well, what has or hasn’t worked. Equally important, community design requires input from everyone involved within the organization­, from the C suite and middle management to employees, staff, and even customers. Community design values everyone as a stakeholder in the organization with knowledge to pass along. All have valuable perspectives about their specific jobs, what it’s like to work in a particular space, or how the work culture supports or hinders its own workforce. In community design, especially in the visioning and programming stages, the primary role of the architect is not to focus simply on the aesthetic or technical aspects of a project, but to act as a facilitator of community. Great communities engage their citizens, and great companies engage their people. It is estimated that when employees are highly engaged, a company’s operating income can increase by 9.2 percent. This community design process uses tools such as surveys and focus groups to understand and build a strategy that truly reflects the organization. This means delving into its culture, work process, technology, environment, brand and, business drivers. The goal is to discover how to improve the overall quality of life in the specific workplace community. Does the company need more areas designed to encourage collaboration? Does the company want to create an increased sense of openness, with more glass and fewer walls? 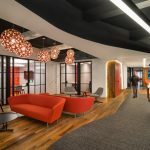 Is the trend toward more “unassigned” space in the workplace applicable, and if so, how could it be implemented to help keep people connected? How can technology such as improved facilities for virtual connection and videoconferencing help deliver better communication? Is wellness an important value for the organization? If so, a walking path, physical fitness center, or prominent staircase can provide benefits not just for building circulation, but also for recreation and health. You’ve heard of walkable communities… how about a walkable workplace? Great communities engage their citizens, and great companies engage their people. It is estimated that when employees are highly engaged, a company’s operating income can increase by 9.2 percent. In a 2002 Harvard Business Review article, Peter Drucker hit the nail on the head when he said, “They’re not employees, they’re people.” Companies that operate using this principle can create exciting environments where people feel inspired and energized, and look forward to coming to work. They’ll want to contribute to the success of the company, and they’ll do it with high levels of engagement. When it comes to workplace strategy, are you asking the right questions? How designers can help companies to align physical environments with core values.